José Arnaud-Bello is an artist with a background in architecture whose research-based work focuses on processes that are reciprocal and determined by multiple actors, such as the relationship between material conditions and culture, the tension between architecture and landscape, and the dependencies between art and discourse. Following their interest in play as a mode of thought and communication, he and Mateo Riestra founded Lupe Toys, which designs toys that promote intuitive learning about the wonders of nature. “Think of the Lemur” was published as part of Triple Canopy’s Internet As Material project area, which receives support from the Andy Warhol Foundation for the Visual Arts, the Brown Foundation, Inc., of Houston, the Lambent Foundation Fund of Tides Foundation, the New York City Department of Cultural Affairs in partnership with the City Council, and the New York State Council on the Arts. Oaxacan artisan, and a tour of a market town. In 2009, while living in England, I received an alebrije: a wooden handicraft from Oaxaca, Mexico, the state where I was born and raised. A friend was leaving London and thought I would be a good custodian of the half-leopard, half-man nahual—in pre-Columbian cultures, a human who takes the form of an animal, and also a protective spirit—that he had received from his cousin a few years back. Intrigued to encounter something so familiar so far away from home, I began to research the history of alebrijes, and how the traditional woodcarvings found their way to London and the rest of the world. My first encounter with an alebrije had not been at a tourist shop in downtown Oaxaca City but on television, in the government-sponsored advertisements that aired before cartoons on Sunday mornings. The ads presented different national attractions, from pristine beaches and forests to historic ruins and indigenous crafts (along with the smiling faces of those who made them, as though indigenous peoples were a tourist attraction, too). In addition to promoting tourism, these advertisements were intended to help construct a national identity—a project started in the decades following the Mexican revolution—for a country with a disparate array of cultural and economic realities. The main message seemed to be: This is Mexico. It’s yours, and it’s part of you. The government had a separate TV ad for alebrijes, which were portrayed to Mexican viewers (as well as to tourists) as a long-standing tradition that embodied a pre-Hispanic worldview. 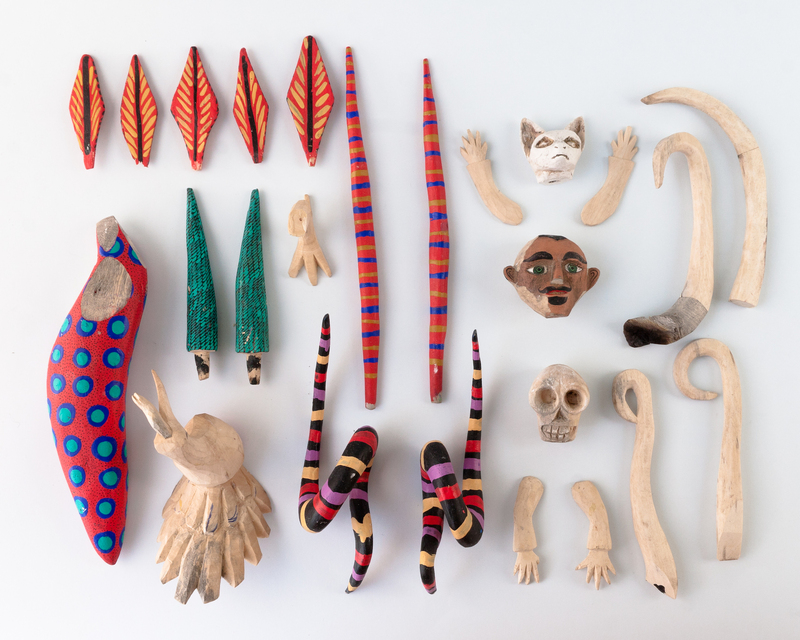 Many years later, I was surprised to discover, through the work of American anthropologist Michael Chibnik, that Oaxacan woodcarvings were likely invented in the 1940s by a single Oaxacan carver, Manuel Jiménez. (The name alebrije caught on much later, around the 1980s, borrowed from the fantastic papier-mâché creatures made by Pedro Linares in Mexico City.) At first, Jiménez sold his carvings through a man with a stall in a Oaxacan market; as foreign tourism increased in the 1950s and a market for ethnic crafts began to develop, Jiménez made an exclusive contract with two Oaxaca-based merchants, one of whom was an American entrepreneur, and became a full-time carver. 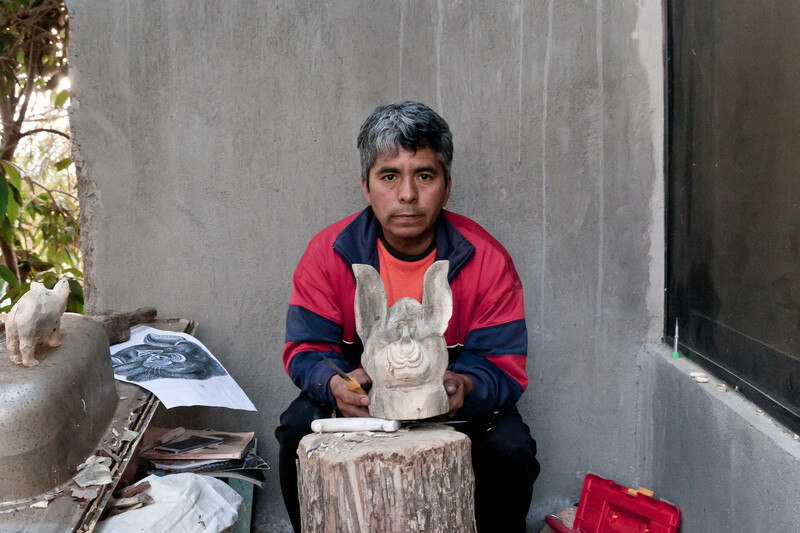 By the late 1960s, Jiménez was so prosperous that other people in his town of Arrazola started imitating his carvings, hoping to profit from the demand the alebrijes were generating. Jiménez remained secretive about his work, divulging little to anyone except his clients; his neighbors were forced to speculate as to how to proceed, leading to a great diversity of styles. The Mexican government quickly latched on to the trend, which coincided with its effort to promote handicraft production in rural communities as an alternative to subsistence agriculture, as well as with its aforementioned project of consolidating a national identity based on the cultural wealth we share as a creative and diverse country. By the 1990s, according to Chibnik, at least three towns in Oaxaca based their economies on the production of alebrijes, a shift that restructured village social life. Each family distributed tasks in more or less the same way: The father carved, the mother painted, and the children helped until they started their own families (and their own businesses). 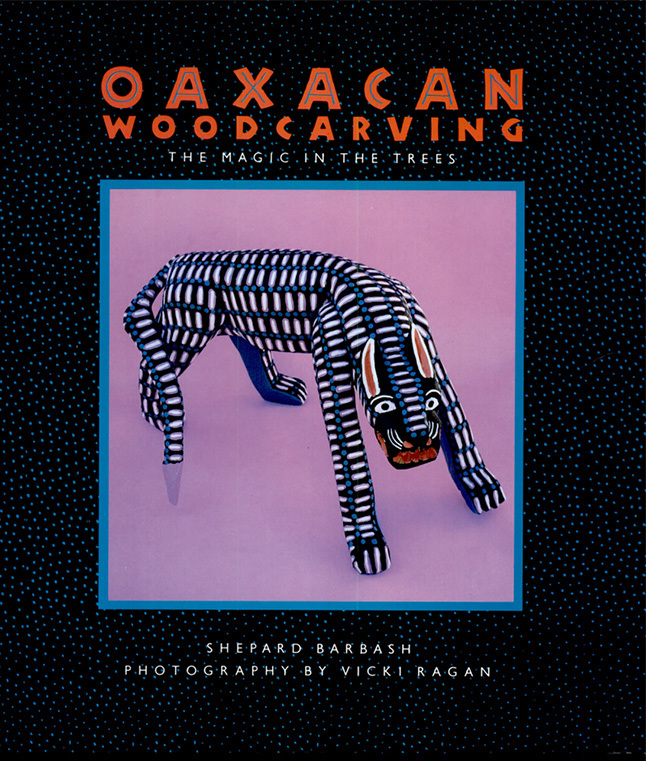 Cover of Shepard Barbash’s Oaxacan Woodcarving: The Magic in the Trees, 1993. 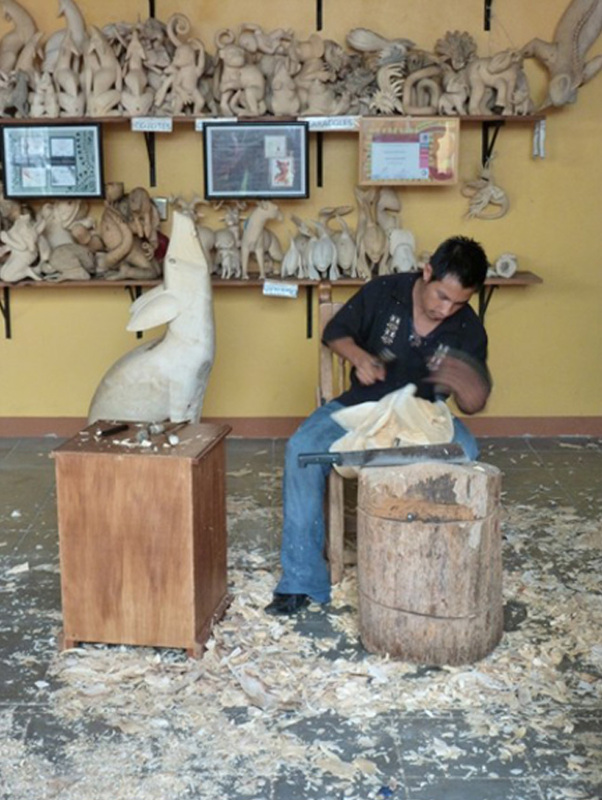 Wood carver at the workshop of Jacobo and Maria Angeles in Oaxaca, Mexico. The nahual alebrije I inherited had a broken leg, bandaged with scotch tape. Regarding the fractured limb as some kind of archaeological clue, I wondered about the travels and accidents the figurine had gone through before arriving in my hands. Why did I feel some sort of identification with this object, with which I shared only a place of origin? What, I thought, might its embedded history tell me about the production and circulation of these crafts? Could it be that its travels and transformations were, somehow, a reflection of my own? The name of the artisan and place of origin were inscribed on the alebrije’s belly: Lauro Ramírez, Arrazola. I decided to make the reverse journey: visit Arrazola and find Lauro. If alebrijes were supposed to materialize some kind of vision or myth, could Lauro and I try to reconstruct the particular story of this one based on what we knew? 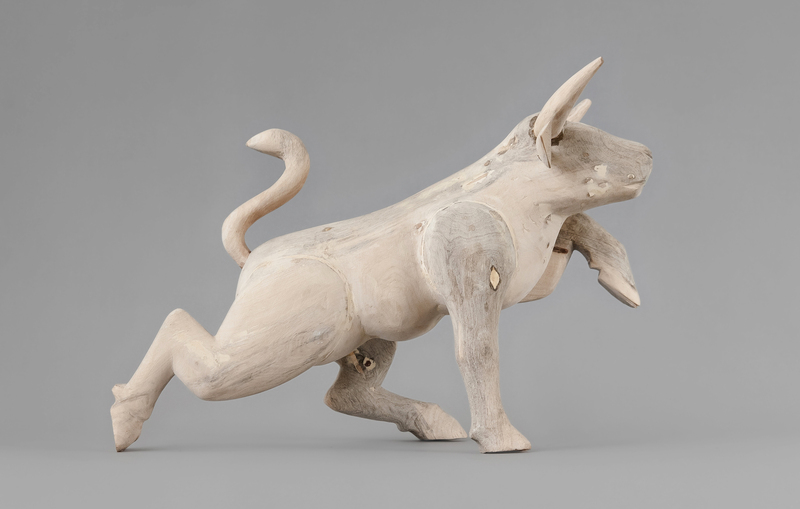 Could we try to interpret all the incidents about which we didn’t know based on the marks inscribed on the piece and wonder together about how its travels had affected the nahual’s shapeshifting abilities? Could our reconstructed story help us decide whether it should stay in its current state or be transformed again? 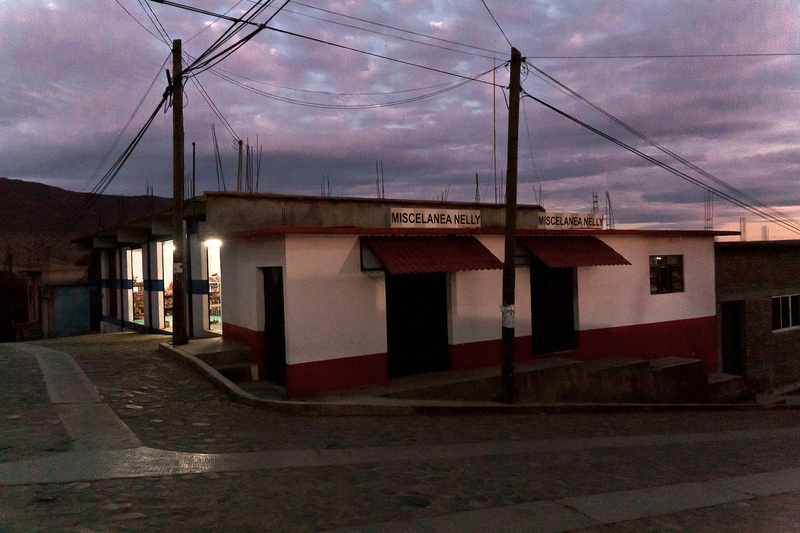 In January 2010, I arrived in Arrazola and asked for Lauro Ramírez at one of the handicraft shops. I was directed to his parents’ home, where one of his nephews led me to his house. 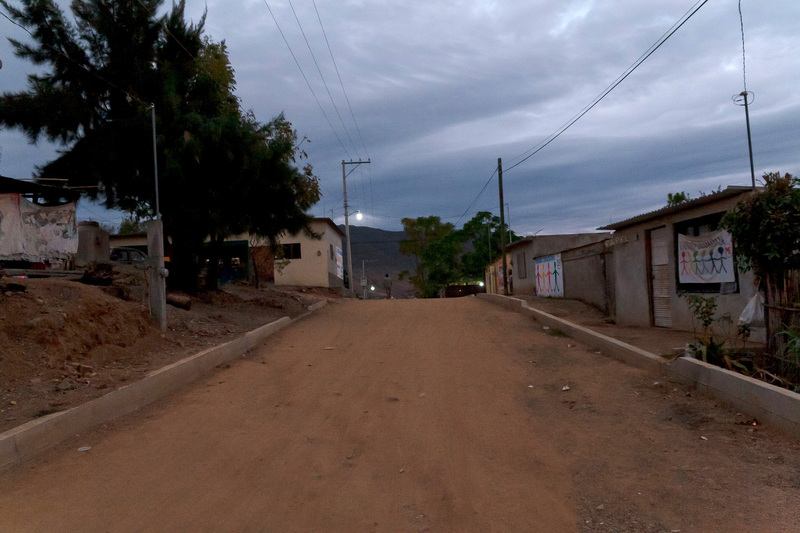 Lauro’s home is on top of a hill, on the outskirts of town. We knocked on the door and Griselda, his wife, led me into their living room; Lauro, who was working outside, opened a sliding window and, to my surprise, jumped through it and greeted me. The TV was on; Lauro’s son was watching SpongeBob SquarePants. Lauro sent him to buy Coca-Cola for the guest. We met several times over the following year. Our communication was marked by a constant effort to translate rather than assume that our experiences or ways of understanding the world were held in common. Lauro and I are from the same state and share many cultural references, but we grew up under very different economic conditions. 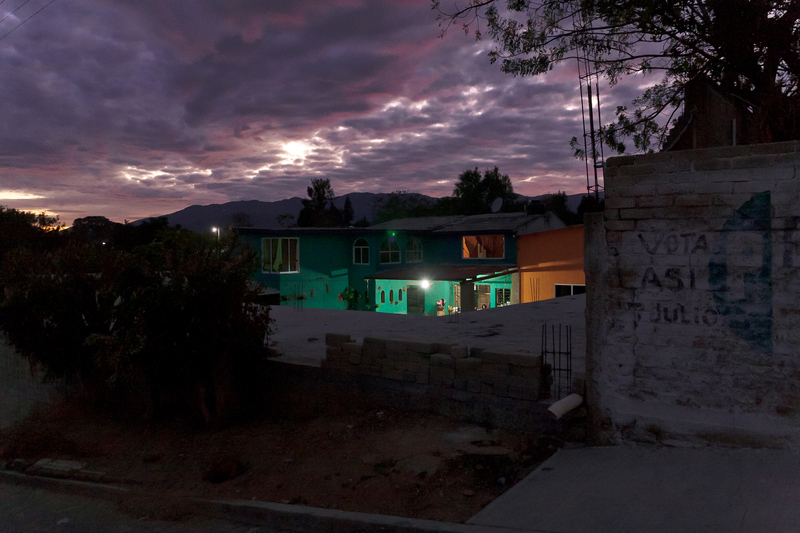 While Oaxaca City itself is more of a town than an urban center, Arrazola was a relatively isolated agricultural community until a couple of decades ago. I didn’t get to see many of the TV programs (like The A-Team or Knight Rider for example) that are common references for my friends in Mexico City, but I am sure this disconnection from “global” culture was much stronger for Lauro. Oaxaca is a state with a great cultural diversity where towns a couple of miles apart often have completely different languages and traditions. Even though Lauro and I communicate in Spanish, we had to constantly check if one understood things in the same sense as the other intended. When one is translating within one’s own tongue, the metaphoric nature of language becomes more evident; each thing one understands is an interpretation. While trying to decide what to do with the nahual, we also shared some personal stories about our work and interests. Our process of constant “translation” eventually led to collaborative exercises in interpretation. I interpreted Lauro’s stories into a series of drawings and a handful of text pieces; Lauro interpreted my stories into a number of new carvings. Since then, our conversations have continued, and I have returned to Lauro’s home on several occasions. We discussed the evolving styles and species of alebrijes as well as the shifting standards defining their patterns, forms, and stories. In parallel, we created a series of artistic exercises for ourselves. What follows is a condensed reconstruction of these conversations, as Lauro and I discussed and reenacted his personal history with the development of alebrije construction. Meanwhile, the nahual has remained broken, standing aslant on Lauro’s shelf. LAURO RAMÍREZ So, what shall we do now? JOSÉ ARNAUD-BELLO I’d like to continue with our conversations. I’m very curious about the process of carving a piece. Maybe if we start by talking about this, our exchange can suggest new exercises for us both to undertake. RAMÍREZ You know I’m open to your proposals—I don’t think many people in Arrazola would be willing to spend time with you on this—but I’d like to know more about what you’re looking for, as I’m quite busy and I’m not sure that I’ll have enough time. ARNAUD-BELLO I’m thankful for your willingness but, to be honest, it’s not like I have a very clear idea of what I want from you. It’s important for me that whatever we end up deciding to do makes sense to you as well—because it sounds interesting or because it might give you the chance to create something that you otherwise would not. RAMÍREZ We usually have a lot to do here. Perhaps because of that, or because sometimes we worry about not being able to sell pieces that don’t seem to meet our clients’ expectations, we don’t allow ourselves to experiment very much. I probably need a little push. 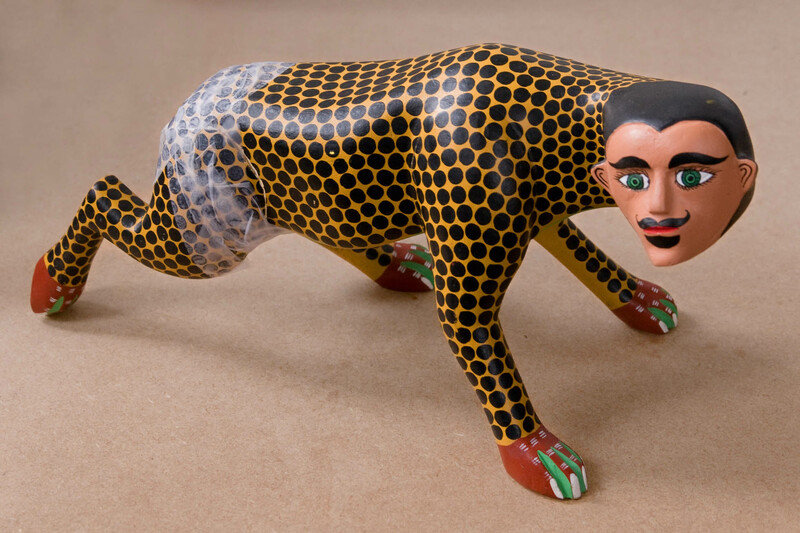 ARNAUD-BELLO It is a notion often repeated by the media and sellers of alebrijes that each artisan finds the animal’s form in the piece of wood. This suggests that each piece is somehow unique, but that doesn’t seem to be the case. Certain figures seem particularly popular, repeated in exactly the same fashion by various carvers: contorting iguanas, howling coyotes, stretching cats. RAMÍREZ Say I’m going to make an owl. I know how to cut its basic form with the machete. I begin with a pyramid, and I know, more or less, the size of the base I must leave so I can carve its legs with the knife later on. I know which parts I have to remove in order to get the shape of the wings, the head, and the rest of the body. ARNAUD-BELLO So, it isn’t so much a case of finding a form in a piece of wood as it is knowing the process of carving a particular figure. RAMÍREZ Yes. One learns how to carve a figure by copying the technique from someone else. I learned from my father, like many people here. Once one can easily repeat the figure, one can develop a more personal style. My friend Miguel has a particular way of making the eyes of a creature like half-moons. When you see a crescent-lidded alebrije you know he made it, or that someone is trying to copy him. Each carver used to specialize in certain figures, but that’s less true now. There’s a lot of copying. But one has to keep trying new things. ARNAUD-BELLO Sometimes commissions can lead to innovation. Is there any particularly atypical request you remember? RAMÍREZ A man here in Arrazola asked for a teddy bear not long ago—a teddy bear holding a heart. He had been planning to give it to his girlfriend on her birthday. I told him it would take me about three months, as it seemed quite complicated. He decided he didn’t want it. I asked him why he didn’t just buy a teddy bear at the store. He said he wanted something special. ARNAUD-BELLO How would you go about making such a piece? Do you use models? Sketches? RAMÍREZ I’m not very good at sketching, so I work directly on a piece of wood and use a pencil to trace the parts to cut. Having a sample to copy is always helpful, but it still takes a long time. If you make the wrong cut, you must start again with a new piece of wood. ARNAUD-BELLO I’m realizing the important difference, especially in terms of economic risk, between carving and painting the figures: While mistakes in painting are easily corrected, a mistake in carving can ruin the piece. RAMÍREZ Yes, though people put a lot more weight on the painting—the details of the patterning, the choice of colors. It seems to be a more direct way for them to value the amount of work we put into it. If a piece doesn’t sell, sometimes we repaint it and that does the trick. ARNAUD-BELLO I’ve noticed a lot of changes in the painting styles since my first encounter with alebrijes. RAMÍREZ At first, back in the 1970s, we would mix limestone with water to paint the figures. Coal was also used, rubbed directly onto the piece. Everything was white or white with black spots, like the skin of cows. With the introduction of paint, we kept the white background but started to paint more defined circles, black and red. Later we painted a yellow dot on the inside of each circle. That’s when we started to use toothpicks to make really fine dots, and fine brushes for stripes and slashes simulating hair or feathers. Very bright colors are in highest demand right now. And everyone is going for greca patterns, which appear more local. ARNAUD-BELLO Last time we spoke, your wife, Griselda, showed me some books from which she adapts patterns. RAMÍREZ Yes, we look for the patterns in books and magazines. Sometimes we use patterns that we see around here, in the ruins. But it can get uncomfortable. We don’t really know what to say when a client asks about the meaning of these designs. ARNAUD-BELLO I imagine potential buyers assume those drawings have a meaning. RAMÍREZ I’m sure they do, but we didn’t grow up with them. Griselda and I would like to learn more about them. ARNAUD-BELLO Some of them remind me of the patterns on the rugs of Teotitlán. 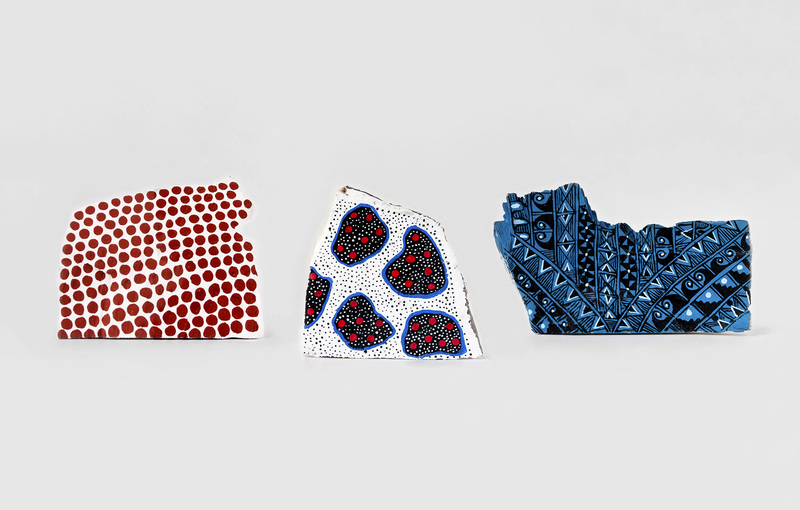 Did you know those were originally Navajo designs, commissioned by American clients? Now we assume they are Oaxacan. RAMÍREZ I didn’t know that. It should be us asking them about the meaning! ARNAUD-BELLO Do you ever consider developing a new way of painting that relates more to your contemporary life than the history of indigenous peoples? RAMÍREZ Not really. My wife was one of the first to use greca patterns. When we took those pieces to the markets we could see our colleagues staring. A lady here in town bought one of our pieces and then started to use the same style. That is a common problem. It’s discouraging. You end up not wanting to make anything new, because it gets copied immediately. ARNAUD-BELLO There can be a good side to that, don’t you think? Having competitors can help improve one’s work. In Oaxacan Woodcarving there are a couple of nahuales made by your father over the course of a year. One can see the refinement of his technique during that short period. RAMÍREZ Back in the 1970s and early 1980s the figures were still very rustic, unpainted. One could see the knife marks. There were a lot of improvements in that period. ARNAUD-BELLO How has your carving technique changed over time? RAMÍREZ At first, my figures were much rougher. We didn’t even use sandpaper. The legs were connected to the body with large nails and they could still move. When we realized that nails rusted and stained the paint, we began to use smaller nails and, eventually, wood pegs. ARNAUD-BELLO The form itself became more refined, detailed. There seems to be more attention to movement. RAMÍREZ The carvings didn’t even stand up properly then. We made the connection between body and legs flat so that we could adjust their position and make them stand neatly. Then we played around, lifting one of the legs and so on. ARNAUD-BELLO I hadn’t noticed that aspect of balance! I guess that experimentation gave way to perfecting the carving of single-piece figures. You have quite a few now. RAMÍREZ Yes, those are the most complex and labor intensive. They’re much more expensive. 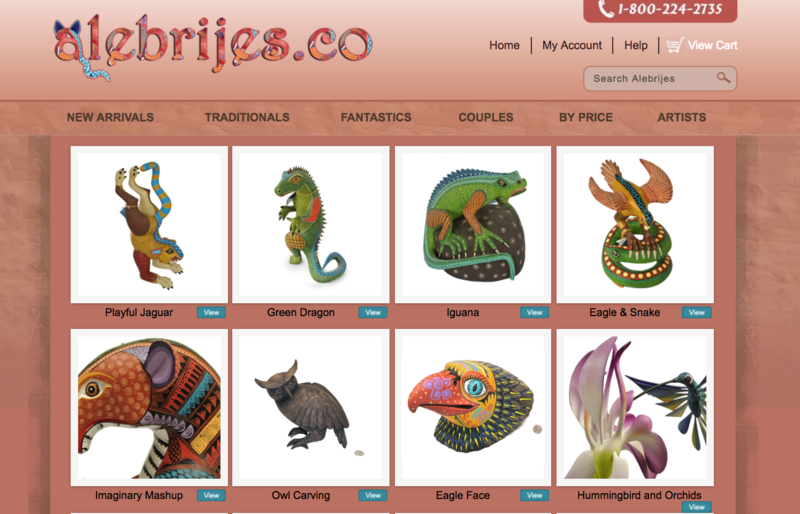 Not everyone wants to pay for them, so we have to make simpler alebrijes that sell for less. In any case, it’s hard to compete. Look at the factory-made pieces in this bag! They’re sold at the Oaxaca market for fifteen pesos each, and that’s already the reseller’s price! I was so angry when I saw them, I decided to buy the lot and study how they’re made. If you look closely, each is machine-cut from a thin sheet of wood; that’s why their forms are exactly the same. Whoever’s producing these must make a bunch for pennies and then hire people to paint them so they look like crafts. ARNAUD-BELLO Do you make the rustic figures from the old days anymore? RAMÍREZ No one would buy them like that. Today, clients want carvings that are very smooth. My wife even tells me that my figures need to be more refined. She’s pushed me to get much better at carving. ARNAUD-BELLO It could be interesting to reconstruct the craft’s history as you’ve just told it: making pieces in the way they were carved, painted, and assembled before. It wouldn’t represent every figure or technique, but it’d be a personal exercise: trying to remember different stages and repeat your past work. RAMÍREZ Do you mean that I start making a figure and you take a picture when it’s in the rustic stage? And then I keep carving it? ARNAUD-BELLO I imagine there being several figures, so we can see and compare them all at the same time. If you don’t paint them, we can see the carving work more clearly. The paint samples could be made on separate pieces of wood. RAMÍREZ I’m not sure I fully understand. We would leave them in their rustic stage? Wouldn’t we at least paint them? ARNAUD-BELLO That’s what I had in mind, so that we can see some sort of evolution. What do you think? RAMÍREZ I think they wouldn’t look as good. ARNAUD-BELLO I think there is something beautiful about the rough, unfinished pieces, but I understand that you see them as not ready for presentation. I guess my only way of persuading you would be to suggest that we would be presenting something else. We wouldn’t be talking about each piece in and of itself, but rather about the relationship between them, about the time that passed between stages and how your approach to the craft has changed. Of course, this is a trap, or a fiction. You can’t actually make them as you did before. Your memories will mix with your current skills. There will be a similar trap when I try to write our conversations and reconstruct what each of us said. It’s very likely that we will be more like ghosts of ourselves, made from my memory. Do you think you could suspend your current criteria while making these exercises and, rather than enhance them, make them as crude or abstract as you remember making them? RAMÍREZ I’m still not sure that I fully understand, but I haven’t tried to make pieces like that for a very long time, and this sounds interesting enough. I can try and see how it goes. ARNAUD-BELLO What animal should we make? Should we repeat the same one for each stage or should we make the animal that was most popular when that style was dominant? 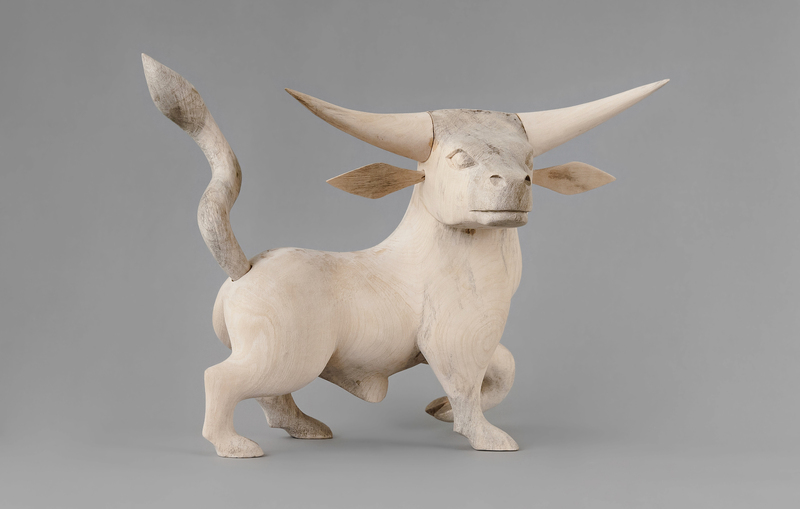 RAMÍREZ As field animals were the first to be made, how about a goat or an ox? ARNAUD-BELLO Let’s go for an ox. I like the implications regarding land and labor. RAMÍREZ Is this more or less what you were talking about? ARNAUD-BELLO They look very good. I perceive a marked jump between the first two stages and the following two. The amount of detail seems to change radically. Don’t you think that we might be missing a figure between those two oxen? RAMÍREZ I can make it if you want me to, but then you will find another one missing, and then another one. We could go on forever. ARNAUD-BELLO True, it sounds a little bit like the idea of the missing link: a sort of impossible effort to define marked stages of a process that is continuous, gradual, and catastrophically abrupt. RAMÍREZ Well, the more pieces you want, the better for me. RAMÍREZ You mentioned painting. Do you have anything in mind? ARNAUD-BELLO Well, you've talked about several styles of painting. How many do you reckon there are? RAMÍREZ We can carve four or five different pieces, but we have at least fifteen different ways of painting. There are many styles. ARNAUD-BELLO What was the progression? You mentioned that coal and limestone were first, then spots, and then more refined representations of hair and feathers. I know that you’re now making grecas. RAMÍREZ It’s not like we stopped using any of the painting techniques, except coal and limestone. Different people prefer different styles. ARNAUD-BELLO We can make a list of all the different styles that you and Griselda have used. What should we paint? I’d thought of using plywood, but there’s something interesting about how each pattern is adapted to the form of the figure. 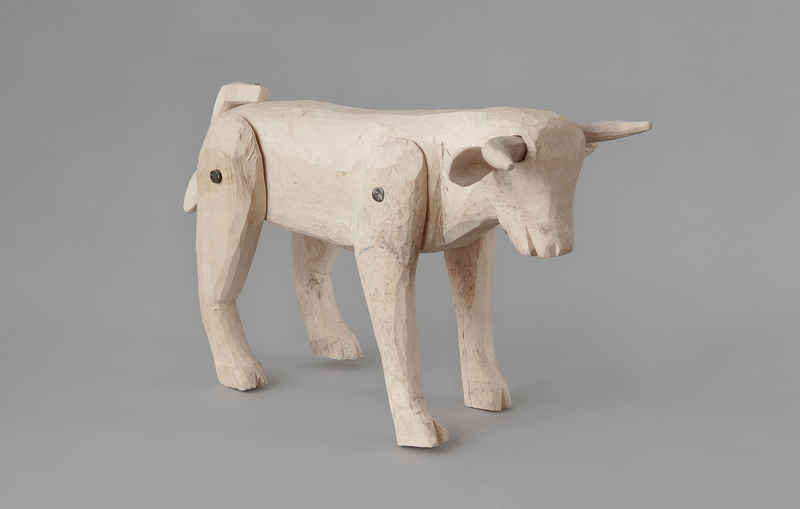 RAMÍREZ Why don’t we use the leftovers of carving the ox figures? Approaching Arrazola, more and more signs—many in English—populate the sides of the road. A crudely drawn bear on a wooden billboard encourages me to keep on driving: the arrow gripped between its jaws exclaims “ALEBRIJES.” Further ahead, yellow letters on a magenta background read: “Visit Pepe Santiago’s Workshop.” Finally, the narrow road from Oaxaca City empties traffic directly into Arrazola's central square where I’m welcomed by a yellow sign which at once proclaims this a “pueblo de artesanos” and warns against scammers trying to sell “communal land” to visitors. Before entering the plaza, the road broadens into an empty parking lot that can accommodate several tour buses. Adjacent to the plaza is a government handicrafts market; only two of the dozen stalls are open. During my previous visit, Lauro had spoken of renting one of these official shops, as his house on the outskirts of town is less accessible to tourists. But today I’m not here to visit Lauro; I want to see the different ways artisans are working, what they are producing, and how they are approaching the commercialization of their craft. A two-story cement-plastered home washed in aqua blue and a warehouse with a large metal door sit side-by-side at the back of a paved concrete lot. This is the only shop that boasts a parking space of its own, with room for two or three tour buses. In front of the house, beneath a blue and white tent, a young woman awaits customers at a white plastic table. To her right, a man organizes a large pile of freshly cut, still redolent copal wood by size. It’s clear by the way the woman addresses him that he is her employee; he, in turn, supervises the work of the five carvers seated in the courtyard, each repeatedly crafting the same segment of an alebrije. The open warehouse door leads into a space filled with long wooden tables organized into aisles. Cats, coyotes, porcupines, rabbits, and other animals, uniformly grouped by species and posture, occupy every table and wall surface. While painted in a variety of color combinations, each type is approximately the same size and constructed in the same manner. All are signed with one name: Pepe Santiago. Examining the repeated forms, the technique becomes evident—how the general shape was cut with a machete, the details refined with knife and chisel. The repetition also reveals the many errors, asymmetries, and contingencies in each piece’s carving. These imperfections are different from those “rustic” carvings produced when the craft was starting to develop in Arrazola; instead, these evidence the rush to complete and sell figures in a market where speed and volume are rewarded over attention to detail or experimentation. It is more profitable to sell large numbers of cheap pieces to mass distributors than individuated, expensive pieces to specialized collectors. A concrete floor is framed by a tubular steel structure supporting a roof made of a corrugated metal sheet. A thick concrete wall faces the street, marked only by a small metal door to one side and a heterogeneous herd of animals painted on the other. Inside the shop, several tables are arranged in a U-shape against segments of cinderblock walls that only reach my waist. Perhaps they’re waiting for window frames or money to continue construction. Three families share the space, their alebrijes each populating two or three tables. The man in charge today is the carver in his family. His tables stand out due to the detailed brushwork and the smooth contours of his figures. The man learned the craft while at the Pepe Santiago workshop. Seeking better pay, he decided to work independently. He still makes many of the traditional figures, but his are more refined than the products churned out by Pepe Santiago, whose workshop operates as an assembly line, the carver explains. Each worker has a particular task: some carve bodies, others make legs, tails, ears, or horns; some sand, others paint. No one lasts very long in that workshop; it’s a place to get a stable source of income, however minimal. A middle-aged man sits in the shade of a tree beside his house. He puzzles over an enlarged photocopy of a nineteenth-century illustration by a European naturalist depicting a bat. The man is interested in bats and has carved many of them. There are a great number of bats in his town, and he saw even more species in a recent exhibition at a nearby cultural center, but he’s never before seen the kind depicted in the illustration, which he discovered when seeking inspiration on the Internet. Using a pen, he copies the drawing’s lines onto a piece of wood roughly carved into the outline of the bat’s head. He’s unsure how to translate the lines from the flat surface of the paper into a three-dimensional shape. It seems impossible not to rely on the ways he has carved bats before, but if he does so, will he be carving the new bat or just copying himself? A modest construction on a corner is home to a hairdresser’s shop. There is an alebrije painted on the building’s facade. A small side door leads to a yellow room full of objects. Inside, a man is painting using tempera on a figure prepared with gesso. He says that all the objects in the room are part of his collection: most are gifts from friends and family, or were bought from other artisans. Included in his collection are empty perfume bottles, used shoes, and other commercial castoffs, as well as fragments of pre-Hispanic pottery and sculptures that he and his neighbors found while walking in the fields or excavating to build foundations for their houses. He considers them all his influences, references, inspiration. 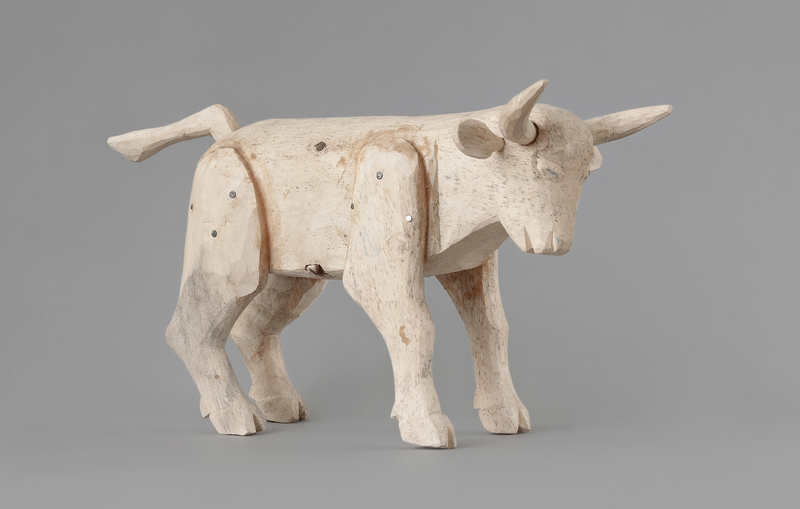 He has a treasured book full of sketches and descriptions for his original woodcarvings. When he finds a potential client, he picks a few illustrations to present as a proposal. If the client is interested, he sets a delivery date, which can be up to two years away. He knows Barbash, Ragan, and Chibnik. He is one of the characters in their books. He enjoyed meeting them and exchanging ideas, but claims, “I am no longer the man they described.” Now less interested in being famous or making a lot of money, he prefers to take his time, challenge himself, and develop his own designs. Inside a house, beyond a well-kept garden, a woman and man paint six-foot-tall fiberglass sculptures. The proportions and style of the figures are reminiscent of manga hero Astro Boy or Kidrobot’s Dunny. 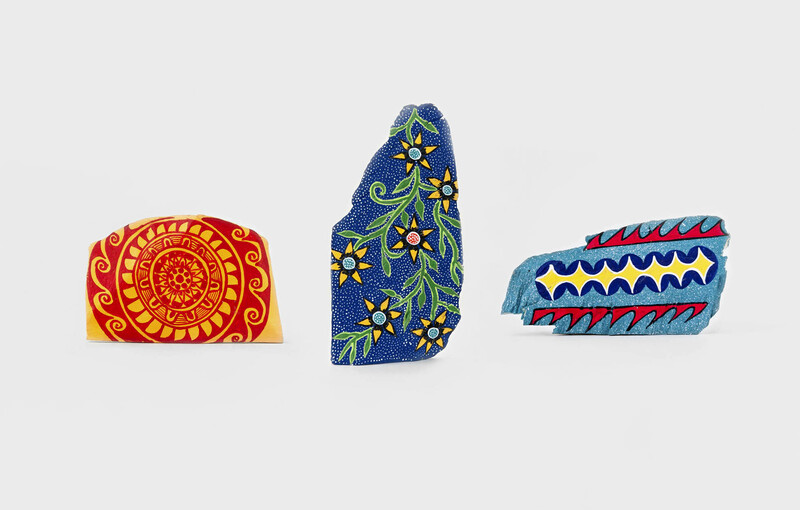 The artisans explain that these sculptures were transported to their workshop, and the painting was commissioned by a fashion brand in Mexico City. Pyramidal steps lead from the street to a narrow, windowless room. As one’s eyes adjust to the light, carvings become visible. Many sit on the concrete floor, while others occupy shelves mounted on the walls. There are an unusual number of giraffes. Many are unpainted, exposing coarse joints. Sometimes, mutant protrusions appear: necks coming out of necks. Giraffe parts litter the floor, surrounding the table near the back wall, where an old woman sits. She uses a knife to graft one piece onto another, binding limbs together with glue. An isolated leg is barely differentiated from that of any other quadruped. The same biological ambiguity afflicts the many heads and bodies. 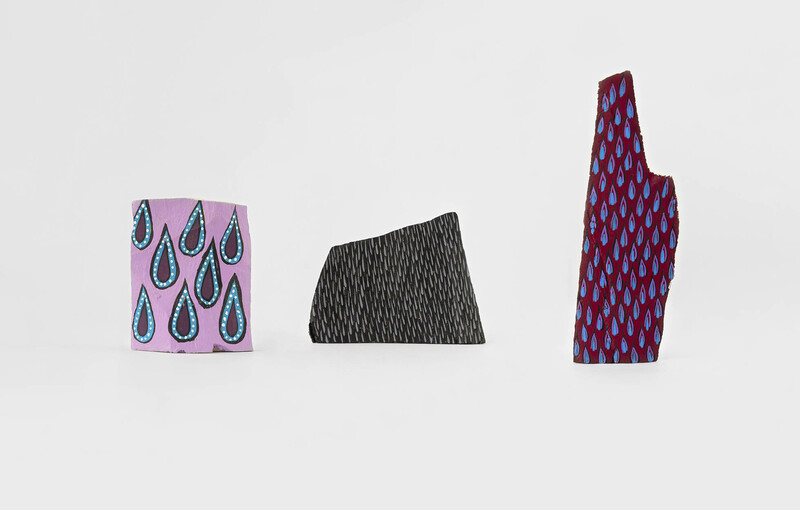 Do the neck pieces alone transform these figures into giraffes? Could she build other species, or find a common ancestor, by mixing the parts in a novel way? A middle-aged woman sits at a table within a fenced garage. She is painting figures with great detail and care using a bamboo stick. There are several magazines on her table, most of which are archaeological; she takes inspiration from the codices and sculptures shown to paint patterns on her alebrijes. She stands up and walks slowly—her hip hurts—toward a storage room. Inside, there are many unpainted pieces and a few finished works. A peculiarly painted jaguar stands out, with its patchwork of white, red, and yellow paint and unpainted wood. “It was unintentional,” she says laughing, taking the piece into the light. As often happens, the alebrije had cracked after she painted it. She filled these small fissures covering the animal’s body with thin pieces of wood and filler. Then she sanded the whole piece to prepare it to be painted again, creating a single, smooth surface patching together the original wood, filler, and paint. One can only wonder about all the happy accidents and unappreciated stylistic discoveries buried beneath all those layers of painstakingly painted patterns. Three large doors roll back to reveal an ample store framed by purple walls. Most of the pieces sold here were made by the extended family of the owners, but they also sell the work of artisans who live far from the town center. 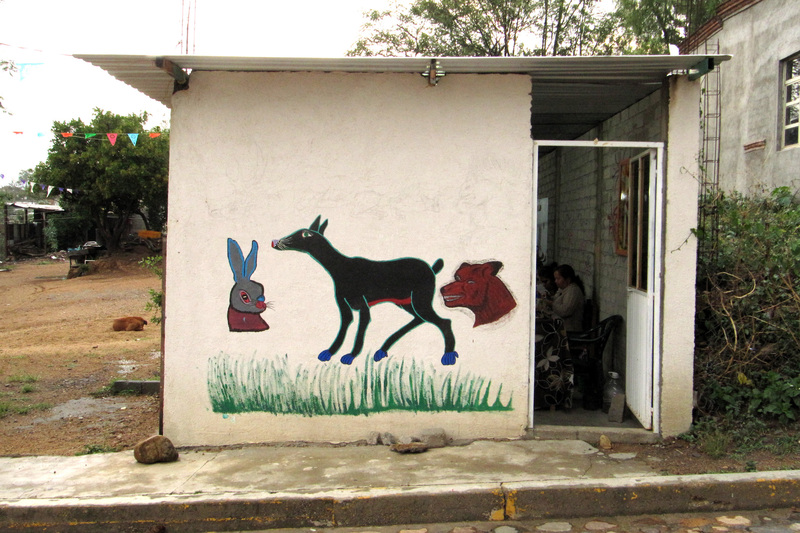 In an adjacent room, other products are distributed among the carvings: baseball caps, Converse shoes, and fabric purses, each customized by one of the family’s teenage girls using alebrije painting techniques. A man drives a truck through Arrazola. He comes from another town that also produces alebrijes. He visits several artisans and buys select figures from each. At the end of the day his truck is fully loaded. Some of the pieces are already painted, but most will be colored at his own workshop. His name will be signed to all of them. At a small store near the central plaza, a woman pays for unpainted pieces. She doesn’t offer much, but some artisans need the fast cash. Later, she will paint these figures and integrate them into her stock. She leaves these unsigned to differentiate them from the pieces that she and her husband carve. A foreign man walks the streets, entering every store, knocking on every half-open house door. He asks many questions but rarely buys a piece. The craftspeople seem to be used to his kind. Every once in a while they ask him if he knows some of the others who have come. He asks for unfinished or broken figures. Every carver has bags of scraps, loose animal parts. Some of them offer to make the pieces he needs on demand. He picks a little hand out of a plastic sack. Ten minutes later he receives three copies of the limb. RAMÍREZ So, is this what you made with the fragments of alebrijes you bought? ARNAUD-BELLO Yes, well, this is a selection of my favorites from the different trials I did. RAMÍREZ I’m quite surprised, you’re good at putting things together. I think Americans will like the egg—they have a celebration where they hide eggs, don’t they? It’s smart of you, doing that piece for them. ARNAUD-BELLO Do you mean the curved piece with the little arms sticking out? ARNAUD-BELLO I didn’t think of it as an egg before. Friends have had other interpretations, but you’re the first one to mention an egg. RAMÍREZ So, what were you trying to make? ARNAUD-BELLO To be honest, I’m not sure. After I bought the fragments I spent a long time looking at them, trying to think of the bodies they might belong to. In some cases—as with some of the heads—it seemed too obvious what their form was supposed to be. Was that the kind of “completion” that the creature really needed? In other cases, I could imagine many different bodies for a fragment. I decided to start with simple, abstract forms that would allow the fragment to have a body, but one without too much definition—like a ghost. I would let them sit on my desk for a few days and see how the fragments reacted to those bodies. If they seemed to integrate, I would consider adding a bit of detail. Many times I had to separate them and start again. RAMÍREZ I guess that’s why I keep my bag with fragments; it’s not easy to find the opportunity to include one of those in a new piece. Why didn’t you use wood? ARNAUD-BELLO I didn’t consider matching the material to be as important in these exercises. I was striving to relate to the fragments I was collecting, and I’m much more familiar with clay modeling than woodcarving. I liked the idea of making a clear distinction between what I’d received and what I’d made. Have you noticed how, in the ruins of Monte Albán, some archaeologists chose to reconstruct using different masonry techniques than the original ones, so that one can tell what they made? I thought of doing something similar—not so much to differentiate each part’s authorship as to emphasize the idea that what I’ve done, in this malleable but brittle material, is an interpretation. I’ve created one body among many possible bodies. ARNAUD-BELLO Sometimes I think of the heads as masks for a body that doesn’t want to reveal its identity. RAMÍREZ I don’t understand how you came to make the egg shape. What kind of body is it supposed to be? ARNAUD-BELLO It was more of a posture than an actual body. I realized that clay adapted to its own weight as it dried. These deformations were much more sophisticated than what I could have tried to sculpt. Their gestures suggest movement or weight. 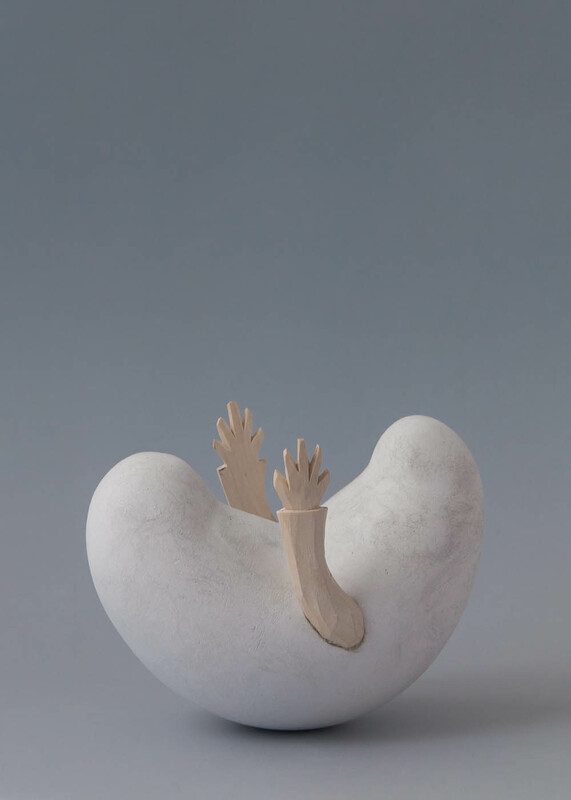 In the case of the egg, the body I started to model began to bend, as if trying to reach for something. That’s how the little hands found their place. RAMÍREZ Yes, wood doesn’t bend as easily. That sounds a little bit like what alebrije sellers say about finding the “magic in the trees.” I remember you took a gazelle with you that wasn’t broken, just unpainted. 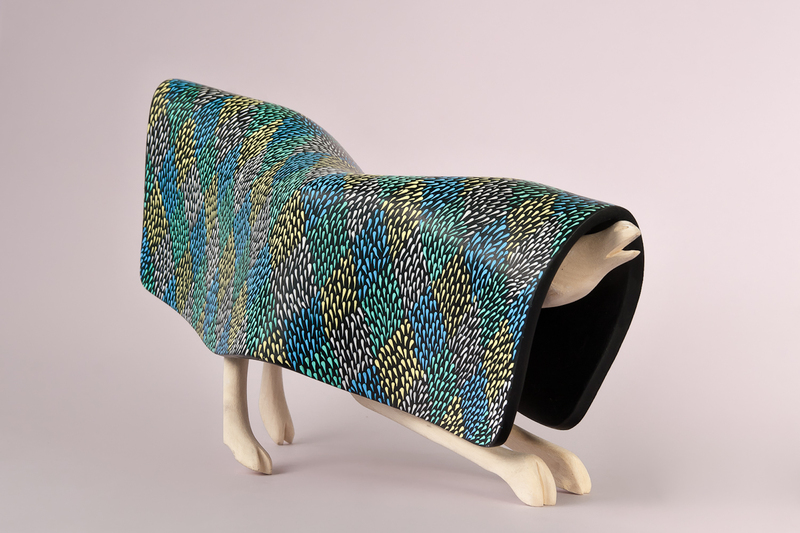 Now I see you’ve turned it into … an armadillo? ARNAUD-BELLO I dropped a thin sheet of clay on top of the gazelle, which adapted to the figure's form. I thought of the division we had discussed between sculpting and painting while making the bulls, and I decided to only paint this second layer. RAMÍREZ I thought it was the shell of an armadillo, but now I can also see it as a trap, some kind of net or fabric, ensnaring and blinding the animal. ARNAUD-BELLO At one point I thought of it as a rug from Teotitlán. That’s why I applied the color using the diagonal pattern. 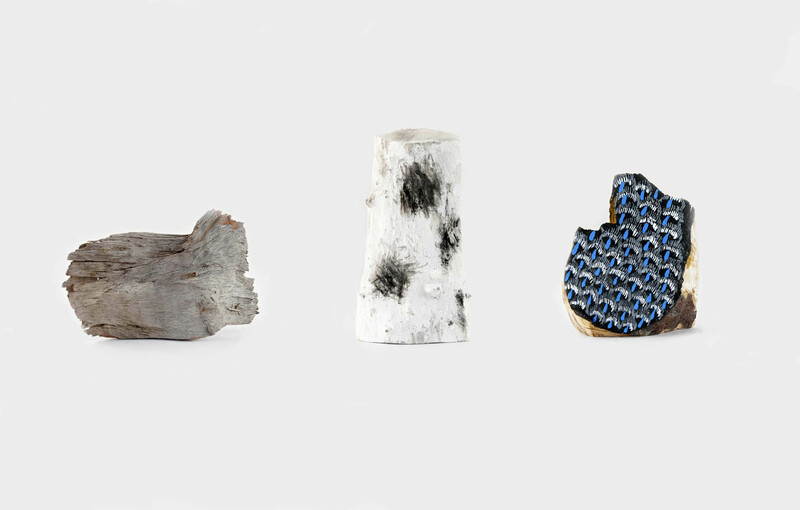 All the hours I spent looking at these pieces made me develop a certain empathy toward them. It was as if I had caught them in the middle of a story, in some kind of predicament. Modeling their bodies was a way of making that visible; like the gazelle trying to escape, or the skull pondering which body to choose. RAMÍREZ Now you sound like Pedro Linares and his visions of alebrijes. ARNAUD-BELLO Yes, though I can’t claim to have had spiritual visions, or that the creatures presented themselves to me. But all that time spent looking at something does mess with your mind a little, you know? RAMÍREZ That’s true. I always tell my kids about how important it is to spend time with the pieces you are making. I believe that when one puts effort and love into them something good will come out. ARNAUD-BELLO I’m not sure it always works out for me. 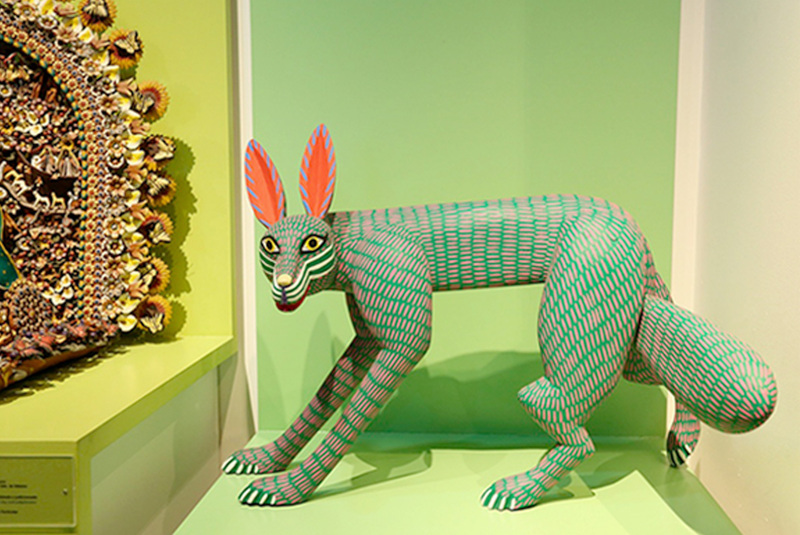 I do relate to how, as soon as he recovered from his illness—which is when he claims to have had visions of the alebrijes—Linares felt compelled to give a physical presence to those creatures he saw. I think that’s very difficult. How do you turn a mental image into an object? How did he remember all the different mixes of animals? Could he remember the details? Or were these his waking approximations of images that he could no longer fully grasp? RAMÍREZ You’ve been talking about ghosts, abstract forms, and ambiguous bodies. Are these phantoms related to your difficulty in shaping the stories of these creatures? Or is it just that you couldn’t make up your mind and decide which body to assign to each piece? ARNAUD-BELLO You caught me on that one. It’s a bit of each: the difficulty of materializing a mental image, letting things take their form, a little indecision. Maybe it’s just an excuse, but I see it as strategic. Doubt can be productive. Considering all the expectations and commercial interests that have standardized the making of alebrijes, a certain ambiguity could help the craft develop. RAMÍREZ Maybe. What about the clients? What if the pieces don’t sell because they aren’t what the clients are expecting? ARNAUD-BELLO Think of your lemur. What one intends is not what the other perceives. Maybe clients will see something new in these pieces. I was listening to a philosopher, Enrique Dussel, talk about myths as rational stories that use symbols. Since symbols are not univocal, myths can be reinterpreted in different contexts. Of course, myths are collective constructions and need a lot of time to take form. 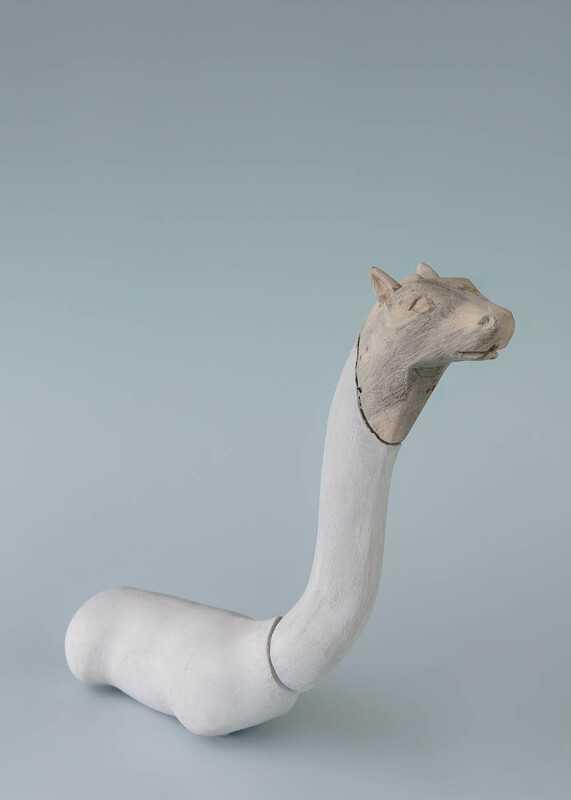 But I began to think about myth-making and the alebrijes—whether one could attempt to produce ambiguous objects that are in a sort of proto-symbolic state, their meaning still to be condensed. RAMÍREZ It’s true that clients like stories. When they ask about the meanings of the alebrijes, I always get the feeling that my answer is almost unnecessary. They are looking for something I can’t grasp, but that they believe is in what we make—something they can’t find in the places they come from. ARNAUD-BELLO It’s a double reflection, each one trying to discover a bit of oneself in the other. How did you feel about making the bulls? I imagine it could be quite interesting to reconstruct and reenact your own history. RAMÍREZ You seemed to like them. I hope they’ll be useful for you. That’s good enough for me. I don’t think I’ll make pieces like that again, but I was inspired to experiment. 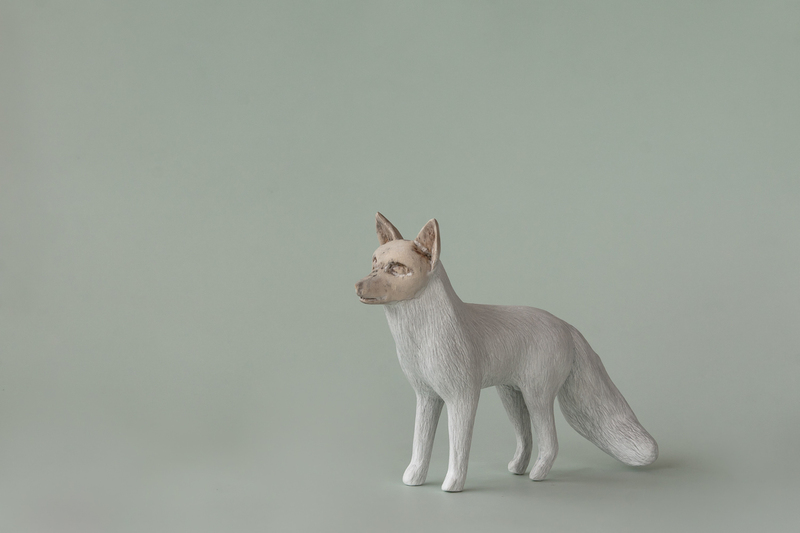 In fact, I wanted to ask if you’d mind if I try to copy the fox you’ve made. I’ve never made one like that, and I like the texture you made for the hair. ARNAUD-BELLO Please do. I’d love to see the outcome. There’s something else I wanted to ask you. While finishing the details of these pieces, I realized how tactile sanding is. By touching the piece, one starts to recognize its traits, then decides to keep these details or to get rid of them. I thought it was interesting that kids do the sanding, and I started to wonder whether this task doubles as training for sculptors. Do you feel this is an important component of how certain family styles have developed and been consolidated? RAMÍREZ I think kids are too distracted nowadays to really get into any of this. I try to get mine interested in the craft. I even ask them to help me and offer them part of what we’ll earn from the sale so they realize that it is a very important part of our economy. But they’re more interested in their phones and their friends. Don’t get me wrong, I think they’re getting good at it, but I just don’t feel they put in all the effort they could. My wife often reminds me that they’re just kids, and that when we were their age we also didn’t listen to our parents. So, at the moment I can’t say that my style inspires them much. I hope my patience will.